The following article demonstrates the usage of the Colors property of the RadTreeMap. The Colors property of the RadTreeMap is a collection of type System.Drawing.Color, which provides the ability to set custom colors. The list of colors will be applied on each group of TreeMapItems. If the amount of predefined colors, exceeds the number of items, the coloration stars from the first color all over again. 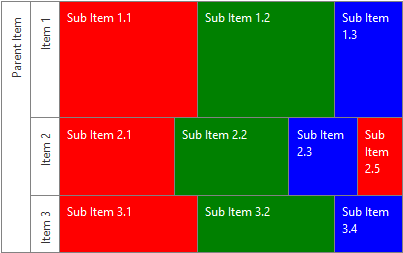 Figure 1: Demonstrates how the RadTreeMap is visualized, when custom colors are set. Note : The sub-items count of Item 2 exceeds the amount of predefined colors. Therefore, Sub Item 2.5 has the same color as Sub Item 2.1.